Septuagint translation of "Helel [read "Helal"] ben Shaḥar" (= "the brilliant one," "son of the morning"), name of the day, or morning, star, to whose mythical fate that of the King of Babylon is compared in the prophetic vision (Isa. xiv. 12-14). It is obvious that the prophet in attributing to the Babylonian king boastful pride, followed by a fall, borrowed the idea from a popular legend connected with the morning star; and Gunkel ("Schöpfung und Chaos," pp. 132-134) is undoubtedly correct when he holds that it represents a Babylonian or Hebrew star-myth similar to the Greek legend of Phaethon. The brilliancy of the morning star, which eclipses all other stars, but is not seen during the night, may easily have given rise to a myth such as was told of Ethana and Zu: he was led by his pride to strive for the highest seat among the star-gods on the northern mountain of the gods (comp. Ezek. xxviii. 14; Ps. xlviii. 3 [A.V. 2]), but was hurled down by the supreme ruler of the Babylonian Olympus. Stars were regarded throughout antiquity as living celestial beings (Job xxxviii. 7). 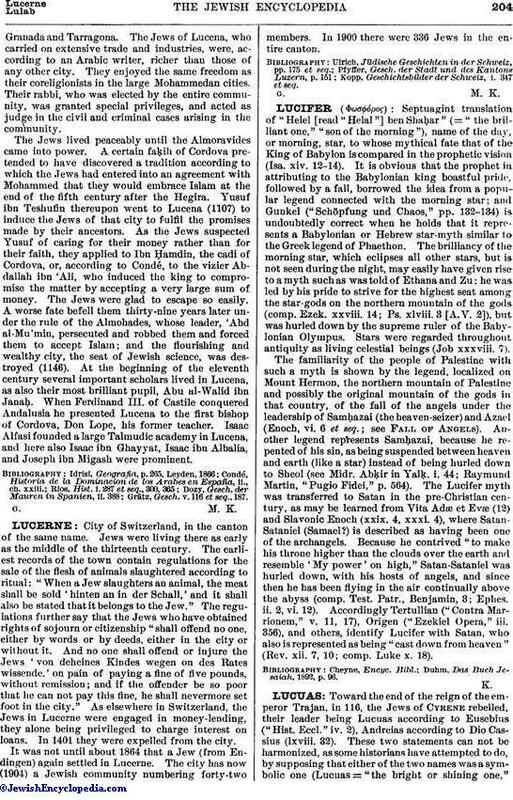 The familiarity of the people of Palestine with such a myth is shown by the legend, localized on Mount Hermon, the northern mountain of Palestine and possibly the original mountain of the gods in that country, of the fall of the angels under the leadership of Samḥazai (the heaven-seizer) and Azael (Enoch, vi. 6 et seq. ; see Fall of Angels). Another legend represents Samḥazai, because he repented of his sin, as being suspended between heaven and earth (like a star) instead of being hurled down to Sheol (see Midr. Abḳir in Yalḳ. i. 44; Raymund Martin, "Pugio Fidei," p. 564). The Lucifer myth was transferred to Satan in the pre-Christian century, as may be learned from Vita Adæ et Evæ (12) and Slavonic Enoch (xxix. 4, xxxi. 4), where Satan-Sataniel (Samael?) is described as having been one of the archangels. Because he contrived "to make his throne higher than the clouds over the earth and resemble 'My power' on high," Satan-Sataniel was hurled down, with his hosts of angels, and since then he has been flying in the air continually above the abyss (comp. Test. Patr., Benjamin, 3; Ephes. ii. 2, vi. 12). Accordingly Tertullian ("Contra Marrionem," v. 11, 17), Origen ("Ezekiel Opera," iii. 356), and others, identify Lucifer with Satan, who also is represented as being "cast down from heaven" (Rev. xii. 7, 10; comp. Luke x. 18). Duhm, Das Buch Jesaiah, 1892, p. 96.